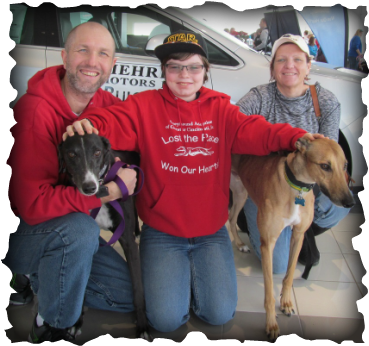 Jedi is a VERY lucky boy to have found his forever home with Annelise, Ron & Ronnie and Anne and Ringo (not pictured) This family loves greyhounds, they adopted Rosie October of 2014. They are still deciding on his new name, could be Bowie. He will have a new name and start the new life with this greyt family! He will be VERY happy in his new home and new life.